We have ridden the Triumph Speedmaster and here is a comprehensive review of the same. The Speedmasteris Triumph's take on the mid-size cruiser and will rival the Harley-Davidson 1200 Custom and Indian Scout. It is based on the Bonneville Bobber but gets a host of changes for that cruiser stance. It looks fantastic with modern touches like all-LED lighting and retro design blended seamlessly. The 1200cc liquid-cooled parallel twin motor is a torquey unit and provides a broad range of shove across the rev range. The ride-by-wire and slipper clutch helps make it effortless to ride both in the city and on the highway. Ride is on the stiffer side though damping is quite good. It handles as well as the Bobber and the only issue we found were the footpegs scraping excessively due to low cornering clearance. At Rs 11.11 lakh, the Speedmaster sits between the Harley-Davidson 1200 Custom (Rs 10.65 lakh) and the Indian Scout (Rs 12.7 lakh). When compared toits competition, the Speedmaster offers better value thanks to its host of electronics and performance. Triumph Speedmaster prices start at Rs. 11.12 lakh (Ex-Showroom). Triumph Speedmaster is available in 1 variants and 3 colours. Share your experiences with Speedmaster? The Speedmaster looks fantastic, has a gem of a motor, rides well, handles well and ticks all the boxes required of a good cruiser. It is priced at Rs 11.11 lakh (Rs 12.34 lakh with Highway kit, ex-Delhi), which places it between the Harley-Davidson 1200 Custom (Rs 10.65 lakh) and the Indian Scout (Rs 12.7 lakh). The Speedmaster is easy to ride and comes with a host of electronic aids that make it appealing even to novice riders while also offering fantastic value. The only issue we had from the bike was the odd handlebar position but even that can be replaced with one from Triumph's extensive parts catalogue. When compared to its competition, the Speedmaster definitely offers better value. Q. Which bike is better between Harley Davidson low rider, 1200 Custom and Triumph Speedmaster? Feature wise as well as road presence wise? Q. What would you prefer Speedmaster vs Harley Custom 1200, if you get chance to buy only one among them, and why? The speedmaster, as it is the more comfortable of the two and better suited for long distance touring. Also, the speedmaster's engine is more refined than the Custom's. Q. Is this bike suitable for tall riders?I am around 6.2. 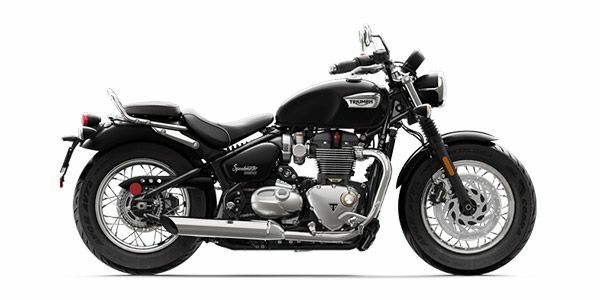 Does the Triumph Speedmaster bring quintessential British sophistication to the American dominated mid-size cruiser space? A new cruiser from Triumph and the open roads of sunny California. What more can you possibly ask for? The Speedmaster is a softened up version of the more focussed Bobber, with traits expected of a cruiser. It might miss out on size but it perfectly marries modern technology with vintage design. It gets LED elements in the headlamp, tail lamp and turn indicators, while the vintage Beach-style handlebars are a nice touch. The optional Highway pack (Rs 1,23,736 excluding taxes) helps give the bike a larger silhouette. The pack includes a front windshield, more comfortable rider and passenger seats, pillion backrest, pannier mounts and two beautifully crafted leather panniers. There are three colours on offer: Red, Black and a two-tone green/white. Fit and finish levels are top notch, as is the attention to detail seen all over the bike. The features list is impressive as well. It has all-LED lighting, ride-by-wire, two riding modes, traction control and cruise control. Though the Speedmaster is based on the Bonneville Bobber, the two couldn't be more different. It gets a rear subframe that’s been beefed up to accommodate a pillion seat, while the rear wheel travel has been reduced. Other changes include twin discs with Brembo calipers at the front, a sharper rake and a fatter 16-inch front wheel. The front forks and rear monoshock have short travel and are a tad stiff. However, they feel plush when compared to the Bobber’s sporty setup, especially the rear monoshock that has lesser travel but gets a variable spring rate. Ground clearance is on the lower side so you do have to be careful while negotiating badly designed speed breakers. The Speedmaster corners quite well for a cruiser and is only held back by its low cornering clearance. The 1200cc liquid-cooled parallel twin motor might have the same internals as the Bonneville T120’s ‘High Torque’ unit but it is tuned to the same specification as the Bonneville Bobber. It is a highly torquey motor with plenty of shove available across the rev range before tapering off post 6000rpm. Refinement is of top order, with only a small amount of vibration creeping around the top end of the rev band. The gearbox and clutch feature light actuation and riding the bike in the city feels effortless.